Corresponding with the West, the element of Water, and the planet Venus: Rose Quartz is associated with the heart, love, peace, romance, intimacy, and beauty as well as bond strengthening, protection from fears and nightmares, stress reduction, and fertility. 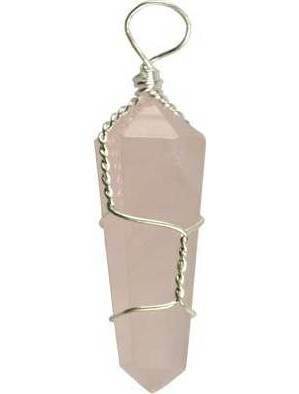 These are natural Rose Quartz double terminated multifaceted points wrapped with a silvertone pewter wire with an attached bail for the ease of hanging or stringing upon a necklace or other cord. Crafted from natural stone these adornment crystals may vary in color and are approximately 13/8 inch by 3/8 inch. Cord not provided.